With the score knotted at 2-2 in the seventh inning, Stewart lined a two-out drive through a strong wind into the right field picnic area for his second homer of the season. The homer capped a big night for Stewart, who had three hits, a walk and a stolen base to extend his hitting streak to six games - over which he's batted .444 (8-18). 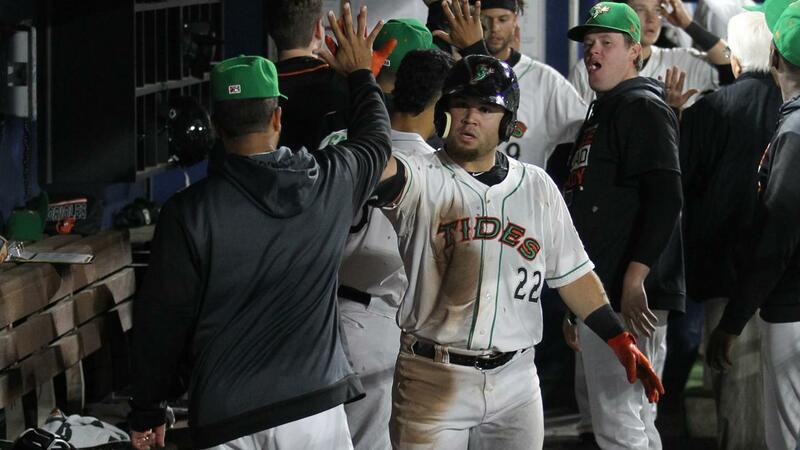 The Tides extended the lead to 6-2 in the eighth inning on a two-out, two-run triple off the bat of Mason Williams. Those insurance runs proved to be crucial, as Dawel Lugo connected on a three-run homer with two outs in the ninth to pull the Mud Hens within 6-5. Luis Gonzalez rebounded to strike out Cameron Rupp to end the contest, snapping Norfolk's six-game losing skid. Akin, rated as the #6 prospect in the Orioles system by MLB.com, was sensational in his Harbor Park debut. The left-hander out of Western Michigan University struck out 10 without walking a batter, including five consecutive batters spanning the fourth and fifth innings. Akin was just two strikeouts shy of matching his career-high, and he threw just 13 balls in his outing as 65 of his 78 pitches went for strikes. Akin surrendered a solo home run to Pete Kozma in the third inning that gave the Hens a 1-0 lead, and Kozma scored Toledo's second run of the contest when he singled and later scored on a sixth inning double by Willi Castro. Chance Sisco had two hits in the win, including a two-run single in the third frame that gave the Tides a 2-1 advantage. The two clubs will continue their four-game set on Saturday night at Harbor Park, with first pitch slated for 7:05. Sean Gilmartin (0-1, 3.00) is set to make the start for the Tides and will be opposed by left-hander Tyler Alexander (0-1, 9.82). Saturday is Super Power Saturday at Harbor Park, and there will be a fireworks show following the game. Notes: Matt Wotherspoon (1-0) struck out two over two scoreless innings of relief to earn the victory…Toledo starter Matt Hall was the first left-hander the Tides have faced this season… Norfolk's roster does not feature a player over the age of 28 years old, while the Mud Hens have five players over the age of 29…After plating 10 runs over the first six games of the season, Norfolk has scored 20 runs over the last three contests.